company based in Calgary, Alberta. We have been proudly serving Residential, Commercial, and Municipal clients in Western Canada since 1969. We specialize in every aspect of sewer and water repair, cleaning, and inspection ranging from a full line of trenchless repair options and excavations to a fleet of flusher, vacuum, hydrovac, auger, and video inspection vehicles. As pioneers in the Underground Infrastructure Industry, we maintain our lead by continually seeking out new technology, continually improving the quality and speed of our work, and maintaining affordability for our clientele. We pride ourselves on finding solutions for our customers quickly and efficiently and have experience with a wide array of problems prevalent in underground infrastructure. Thuro is a City of Calgary Indemnified contractor, meaning that we can legally work on City property. We are committed to delivering the highest quality of work, conforming to City specifications and inspections. Thuro guarantees this quality work by signing an agreement of responsibility for any deficiency, years after the job is completed. Whether it is repairing older services or installing new ones, we are proud to serve the City of Calgary and the rest of Alberta. Thuro Inc. is an active member of the Alberta Construction Safety Association and is registered in the “Partnerships in Injury Reduction” program with Alberta Worker’s Compensation. Thuro maintains a certificate of Recognition with A.C.S.A. It is our company’s policy to comply with all O.H. & S. regulations. 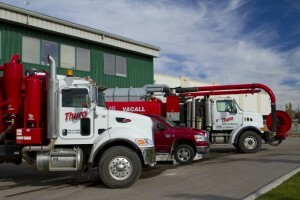 Thuro provides extensive training for our operators to allow them to work safely and efficiently. This training includes, but is not limited to, WHIMIS, TDG, First Aid, Confined Space Entry and Rescue and Vehicle Pre-Trip Inspection. Thuro Inc. is registered with W.C.B. in all four Western Provinces. All accounts are in good standing. Our Workers are covered under the relative W.C.B. plans throughout Western Canada. All operators are bonded and project specific surety is provided where necessary. Contact us to find out why Thuro is the best choice.